Alberto Contador won his third Tour de France in four years on Sunday, heralding the arrival of a new cycling superstar as seven-time champion Lance Armstrong competed in the race for the last time. Mark Cavendish of Britain claimed his fifth stage victory this Tour and the 15th in his career in a sprint at the end of the 20th and final stage - a largely ceremonial 63.7-mile course from Longjumeau to the Champs-Elysees in Paris. The 27-year-old Contador sealed his third title by holding off a dramatic challenge from his main rival, Andy Schleck of Luxembourg, in Saturday's individual time trial. Schleck finished second, 39 seconds back, and Denis Menchov of Russia was third overall. Contador exchanged hugs with his Astana teammates, who began chanting "Ole, Ole, Ole, Ole" on the famed Paris thoroughfare as thousands of fans lining the route cheered. Contador joins Greg LeMond, Louison Bobet and Philippe Thys as a three-time Tour champion. Armstrong is the most successful Tour rider with seven consecutive wins, between 1999 and 2005. 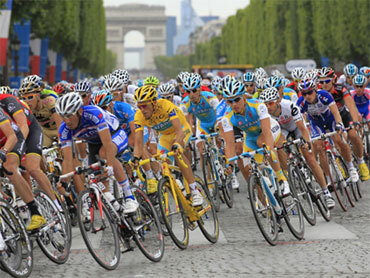 Armstrong completed his last Tour in 23rd place, 39:20 after Contador, his former teammate and rival. It was a far cry from the American's third-place finish in 2009 on his return from a four-year retirement. Armstrong's last ride in his most beloved race began in controversy. His RadioShack team was temporarily delayed from starting on Sunday for wearing improper jerseys, the race beginning about 15 minutes late as a result. TV images showed Armstrong and his teammates putting on normal jerseys with their correct race numbers after they had tried to wear black jerseys with "28" on the back. The figure was chosen to honor the 28 million people fighting cancer, one of the themes of Armstrong's Livestrong Foundation. But International Cycling Union officials said they had to change their jerseys and wear the official race numbers. Contador sipped champagne during the leisurely ride and held up three fingers to signal his third Tour win. His Astana team was always likely to quash any attempt by Schleck to break away Sunday. Also during the ride, Contador, who is known as 'El Pistolero' for his trademark finger-firing gesture, took a blue plastic squirt gun and sprayed photographers.